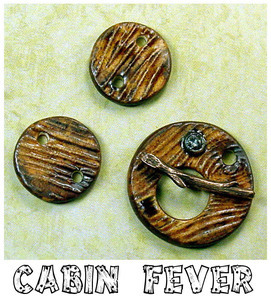 I'm part of Earthenwood Studio's Design Team, and this month's theme is Cabin Fever. 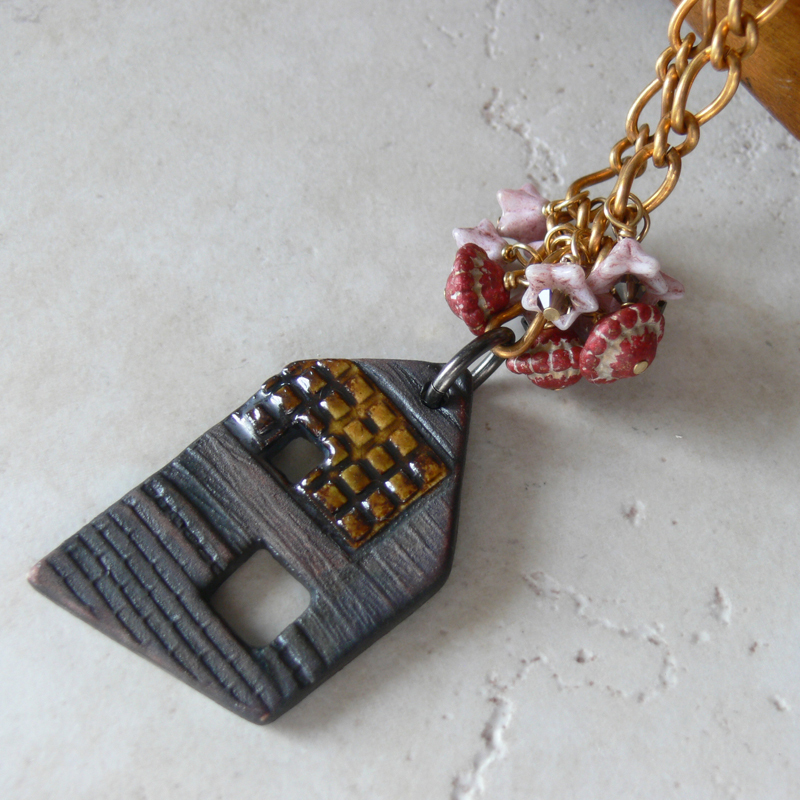 Along with the components above, Melanie sent a house pendant. Today I finally had some time to work with these unique pieces. I'll admit -- these are way outside my comfort zone. I'm a colorful-lampwork-glass-and-sterling-silver kind of girl. 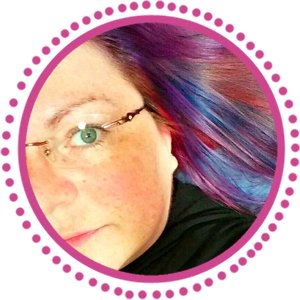 So I spent some time with both my trusty graphic designer's color book, opened lots and lots of bags and boxes of beads, and finally decided to NOT color coordinate the beads but go for the unexpected -- pink. I call this "Flowers in my Cabin" and imagine a cabin out in the woods -- WAY out in the woods -- where a solitary person lives with loads of books and happily cultivates beautiful flower gardens. The brass chain isn't oxidized, or raw brass, but rather a nice, warm brass, which I thought complimented the brick-work around the window nicely. And what flower garden would be complete without a bird? 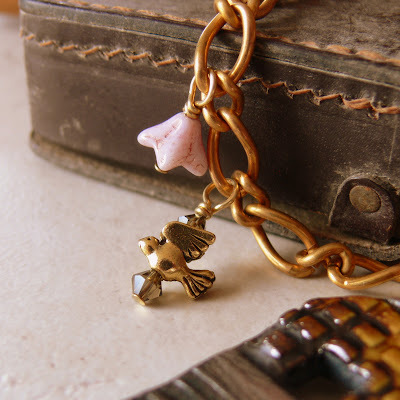 Since the pendant is so striking, the necklace is basically the pendant, flower cluster, and the bird with a single flower floating above it part way up the chain. Nice and simple. Next comes the Cabin Fever components. I used the toggle and one of the disks. 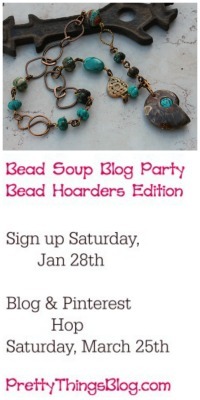 I had some very cool polymer clay beads on hand and got cracking. The blue reminds me of the color of porch ceilings in the old cabins at the seashore -- I'm imagining the ones up in Maine. The wood-grained ceramic toggle and disk mimicked the vision I had of the summer cabin, and the blue could just as easily represent the ocean. 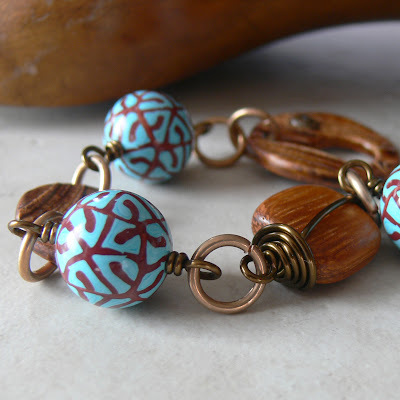 I linked the beads together with bronze rings and added one single wood square, wrapping it with Vintaj wire. This one is called "Seashore Cabin". So what do you think? Did I meet the challenge well? Working with components outside my comfort zone is often more difficult for me when my brain is tired (and it's been tired lately) but I like what I came up with. You can visit Earthenwood Studio by clicking here, or visit their Etsy shop by clicking here. ADORE the bracelet!! 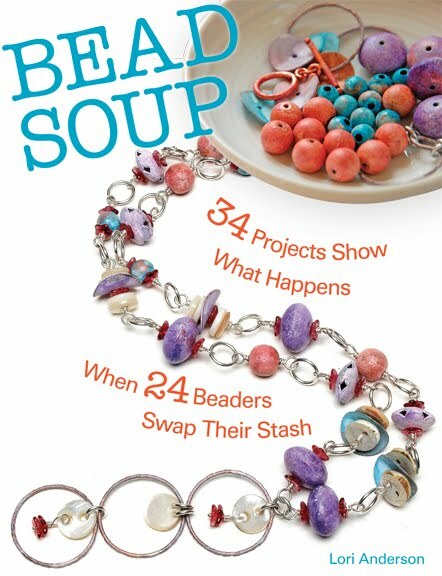 Those clay beads are FABulous, love how you combined it all. No, that isn't your usual style--but you nailed it anyway! See how flexible you are? I like how you wrapped that flat wood bead. Love to see a wider shot of the necklace. Love the flowers with the little house pendant--great idea! The soft little flowers are a great foil for that rustic pendant. Love them both, Lori. You sure intrigued me when you told me how you added the pink - what a pop of the unexpected. Your pictures are fabulous. I LOVE the necklace and that sweet cabin filled with books and a beautiful garden. The imagery was perfect for the bracelet as well...I can just see that cottage now. And love the wirework with the Vintaj wire! Beautiful! 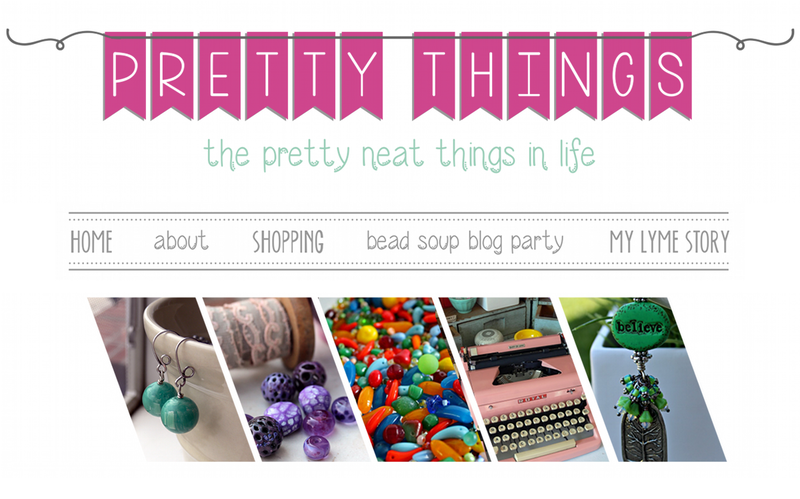 I love the flower beads and the pink in the first one. Your explanations behind the inspiration are charming. Enjoy the day! Both pieces are lovely and evoke exactly the images that were in your mind. You stepped outside your zone and into a beautiful world of imagination. What a wonderful piece!! One would never guess that you were creating outside of your comfort zone. Your little cabin piece flows so smoothly and seamlessly!! A perfectly awesome piece. You should maybe step outside every now and then. A breath of fresh air is good for the soul. 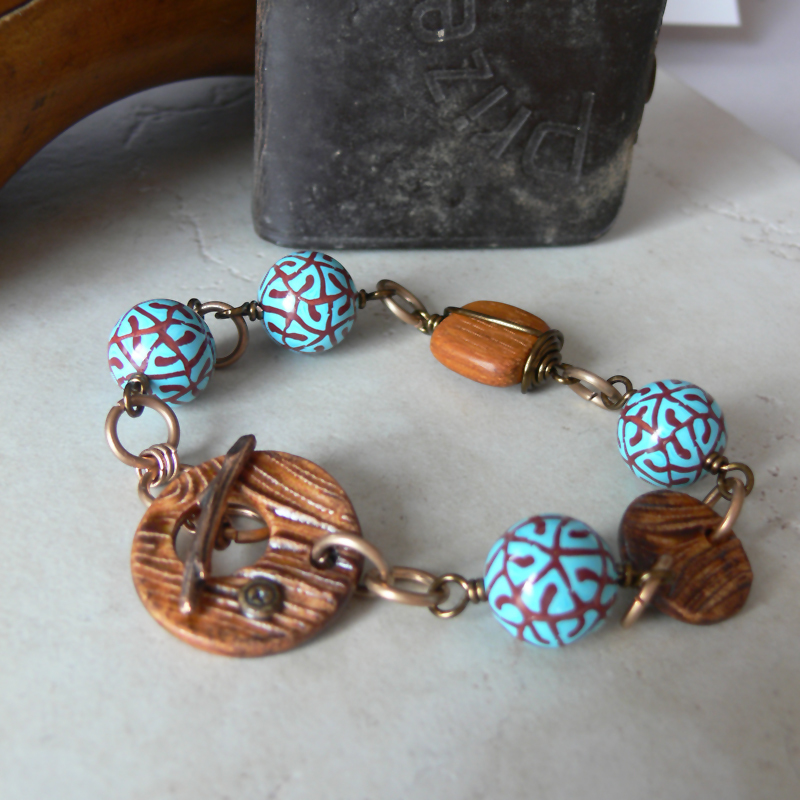 The seashore cabin bracelet makes me swoon with its beauty! These look like they were a lot of fun to make. :) Nicely done! I think you captured the spirit of the competition beautifully, creatively. You definitely went way outside your comfort zone and worked with new color combinations. I would not have thought about adding pink to brownish colors! I really love the bracelet. Perfect combination of coors and beads! I work with some pink lately, but I think it'll never become my fav color. I love your pieces. The house with the flowers, beautiful. The colors work together. But then, your work is always great!!!!! Lori, you have really complimented the components so nicely the colours work really well, and your inspiration makes an interesting story, well done I love them both! These are wonderful! I am glad my beads were out of your comfort zone because you made some really cool stuff with the challenge. Pink is actually one of my non-comfort zone colors, so it is really neat to see it with my usual color palette! Thanks for playing!